Not a lot going on here. We're at a low ebb for Marvel, after they stop being cheesy fun but before they start getting serious. Spider-Man under Conway is hit or miss. 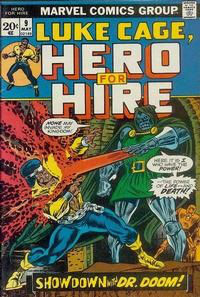 Under Stan Lee this was Marvel's consistently best title. Under Conway, it's sometimes good, sometimes pretty bad. Steve Englehart's writing is a notch above everything else here, especially when he's tackling political issues, but he's also much more invested in big continuity-laden stories than i had realized before beginning this project. Steve Gerber is writing Daredevil and a few scattered other things but he's not fully developed into the zany writer that people love so much. His stories are fairly generic at this point. I don't have a lot of nice things to say about the art this year either. Ross Andru takes over Spider-Man and manages to keep the house style but doesn't really add anything. One notable shift is the increasing popularity of horror comics. Werewolf By Night, Tomb of Dracula, and Man-Thing started last year, and this year adds Frankenstein (although the original 12 issues take place in the past and aren't in my project), the Living Mummy in Supernatural Tales, and Tales of the Zombie (although i've pushed the early issues into the 1974 category for continuity reasons). Marvel also launches a number of black & white horror magazines (Tales of the Zombie is one, actually, and there's also Dracula Lives!, Monsters Unleashed, and others). 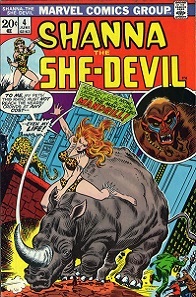 The foray into magazines was in part a way to have more "adult" stories (in various senses of the word), since they were not ruled by the Comics Code Authority, and was also a reaction to a larger explosion of the horror genre in comics generally. What's interesting to me is how this genre did not replace Marvel's super hero universe but was instead incorporated into it. Prior to the Marvel Silver Age, comics went through fads reflecting various trends, and in a sense that still continues, but the Marvel universe itself is so solid and popular that those fads become part of the Marvel universe instead of standalone comics. Speaking of fads, Shang Chi and his cast of Master of Kung Fu characters are introduced in Special Marvel Edition this year. Bill Everett and Syd Shores both died this year. Creator notes: John Buscema is still out there, keeping the Fantastic Four looking consistent. Everything else is by lesser known artists and the quality isn't very high. There's a tendency to attempt experimentation along the lines of Colan or Steranko but the talent doesn't match the ambition in a lot of cases, leading to muddled looking pages. Marv Wolfman is added as an Assistant Editor. Jim Steranko is being wasted drawing stuff for FOOM (Friends of 'ol Marvel) Magazine, an in-house fanzine. 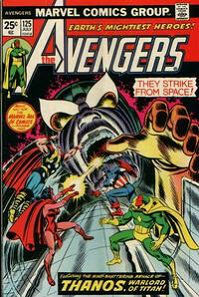 Notable events: The highlight here is Jim Starlin's Thanos War, which he drew and mostly wrote. Starlin's epic feels about 10 years ahead of its time. He brings back a crazy Dikto cosmic weirdness while handling a fairly complex plot and introducing a number of compelling characters. There's not a lot in the way of character development, and the ending is a bit of a let down, but it's still a great adventure story and a standout among the rest of Marvel's output at the time. Notice in addition to (or in some cases as part of) the number of horror and Kung Fu characters, we are seeing more non-white heroes and villains introduced. Marvel Feature #12 Thanos War. Thanos, Starfox, Drax, Eon, Titans. Captain Marvel becomes cosmic protector. Captain Marvel #31-33 Conclusion of Thanos War.